By Phyllis Korkki for The New York Times – ISN’T it just a matter of time before women reach parity with men in the upper ranks of the corporate world? After all, women in the United States now collect nearly 60 percent of four-year degrees and they make up nearly half the American work force. But despite headline-grabbing news like the recent naming of Meg Whitman as chief executive of Hewlett-Packard, a look at the numbers shows that progress at the very top has stalled. Last year, women held about 14 percent of senior executive positions at Fortune 500 companies, according to the nonprofit group Catalyst, which focuses on women in the workplace. That number has barely budged since 2005, after 10 years of slow but steady increases. Not that there hasn’t been some progress. A rich source of female talent exists just below top management, says Sylvia Ann Hewlett, founding president of theCenter for Work-Life Policy, a research organization. But women have become stuck in this layer because they tend to lack a sponsor at the top to advocate for them, she says. Sponsors are different from mentors, who lend friendly advice and allow workers to share their quandaries and challenges. Sponsors make a direct bet on the promotion of their protégés, putting their own careers on the line by doing so. That can be risky, so such relationships demand a high level of trust. 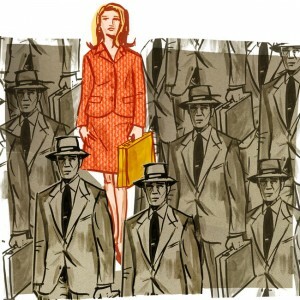 ”Women tend to be overmentored and undersponsored,” says Ms. Hewlett, who has done research to find out why. One reason is that women are more uncomfortable using their work friendships to land a deal or to join a team, she says. For men, those kinds of interactions tend to be second nature. Another tripwire is more insidious because it is awkward to discuss. Most of the people in senior management are men, but many are very reluctant to take on women as protégées because of the sexual dynamics, Ms. Hewlett says. They fear that gossip will spread if they are seen regularly with a junior female colleague. Companies must face this uncomfortable reality head-on, she says. They need to make sponsorship a transparent and integral part of the culture, so that when a male senior executive is seen with a lower-level manager, it will be assumed that he’s a sponsor. SELF-PROMOTION is another crucial skill for those intent on moving up, but women are more likely to consider such behavior unseemly, says Peggy Klaus, an executive coach and leadership expert in Berkeley, Calif. With men, “it’s expected that you’re going to showboat a little,” she says. As Ms. Hewlett put it, “Women have this extraordinary faith in the meritocracy,” and this can carry them through at lower levels. But they need more if they are going to push through to the very top.